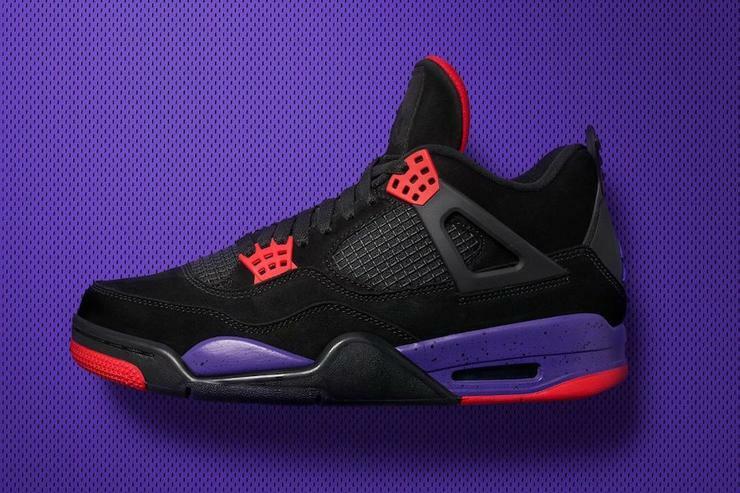 This weekend the "Raptor" Air Jordan 4 will make its debut, starting Saturday, August 18th at various sneaker outlets all across the country. Though, initial reports indicate that they won't be evenly distributed. Judging from Foot Lockers Release Locator, the Raptors Air Jordan 5's will be available at every location in the franchise, though the Footaction locations will only have them available in select locations. Other sneaker outlets are spotty at best. Just like the "Raptors" Air Jordan 7 that released in 2012, this upcoming sneaker features a black nubuck upper accompanied by hits of red and purple which is more in tune with their classic dribbling dino logo. It was originally believed that this particular Air Jordan 4 colorway was an OVO collab, complete with Drake's signature under the Jumpman on the tongue, but the retail version won't include any nods to the Toronto native. I actually like those a lot. The all black with the pop of purple and a touch of red, it is really clean looking. Are these running for the same price as the standard J's or is the price tag higher? I might get me a pair. Most places around here are sold out or only have a small number of sizes left. Looks like they sold out online at some spots too. I was thinking these would be under $200 but I shouldn't be surprised. They are some dope shoes. My cousin got a pair of them. I wanted to get a pair but didn't have the cash for them. They look even better in person. I don't care too much about matching kicks to clothes so it wouldn't bother me. I'll have to wait till they come back in stock over here. I can find them online I am sure but I wanna see them in person and try them on before I buy a pair for that price. A lot of online prices shoot up too when stocks are low so be careful with that. I can understand wanting to see them before buying. I got a pair of shoes a few years back that looked completely different than what I was expecting them to. I'd like to see them come out with another color variation. Maybe some red and blue ones Not big on purple myself. I can't hate on them though cause they look good but I have to pass just cause purple isn't my color.